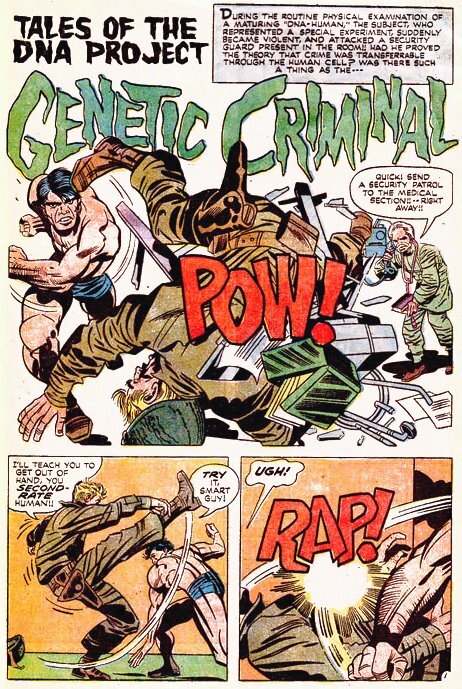 I very nearly didn't make a special post for Jack Kirby Day because every day is Jack Kirby Day so far as I'm concerned. But as I looked over all the other cool posts throughout the comics blogosphere, I remembered something I was meaning to share with you. Kirby is often hailed for for his dynamic art and the wild imagination of his visuals...but his actual writing is occasionally scorned, or at best too often overlooked, when he was in fact a consummate storyteller. The cosmic vistas and space gods and twisted monsters weren't just there as eye candy: he created them all in service of a deeply humanistic outlook. Yeah...screw you, Spiegelman, and watch your lying mouth, Warren Ellis: Kirby's work was all about humanity. When his stories went to Asgard or New Genesis or the Negative Zone, it was to explore human feelings and aspirations and passions every bit as much as the stories he set in Suicide Slum or France in WWII. 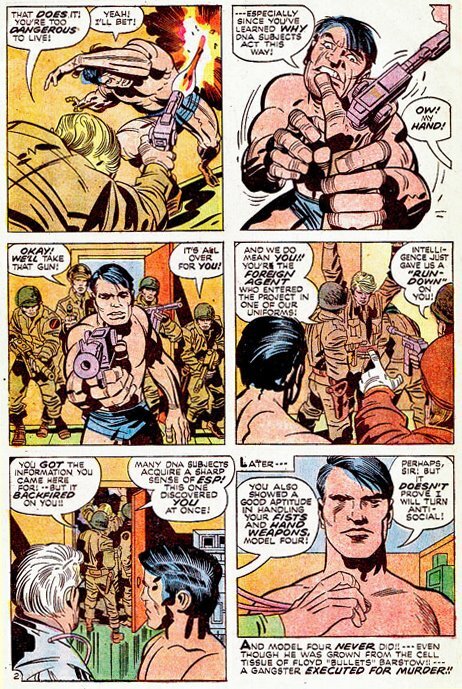 And to demonstrate what a full-realized storyteller Kirby was, here's one of his stories. It has humanity, it has heart, it has action that flies off the page, it has plot development, it has a twist ending, and it even has an unspoken but potent moral...and it does all this in two pages. Any comics writer would be proud to write two pages as perfect as this little gem...but for Jack Kirby, it was just another day's work and probably nothing special. From Inferior Five #1 (cover dated March 1967) with script by E. Nelson Bridwell and art by Mike Sekowsky and Mike Esposito, an example of how the passage of time may change the way we read certain comics. Either that, or Nelson was years ahead of his time in surgical techniques and, you know, the other thing. HAVANA (AP) - Fidel Castro has put out a cryptic statement, some 24 hours after it was revealed he's in the hospital. Castro isn't actually seen or heard. Instead, the statement was read tonight by the host of a program on state-run Cuban television. In it, Castro says his health is "stable" and where his spirits are concerned, he feels "perfectly fine." But Castro goes on to say -- quote -- "I can not make up positive news." Still, the statement offers no specifics on the Cuban leader's health after his intestinal surgery. Castro is also urging Cubans to stay calm and go about their daily routines. The nearly 80-year-old president says the country "is prepared for its defense" and that "everyone needs to struggle, and work." Wet birds fly at night. I wouldn't want to own everything. What would people give me for my birthday? They say ugly is the new cute, but that doesn't make any sense. Could God make a boulder so heavy that even He couldn't lift it? What if He does that all the time, to keep Himself humble? I wouldn't vote for the mayor. It's not just because he didn't invite me to dinner, but because on my way into town from the airport there were such enormous potholes. Why don't they give you the toothpaste and water they've collected from other people when you get off the plane? When Raul, Camilo, Che and I were hiding in the Sierra Maestra, you know what kept us sane? Baseball scores. General! The dog has mangled my hologram! Hugo Chavez has an imaginary friend named Mr. Tigglesworth. That's right, Hugo, I told the whole world! What are you going to do, give me a tumor? A cat may look at a king, but the cat would be really bored and unimpressed. Unless the king was made entirely of yarn. Or aluminum foil. They named that gay neighborhood after me as a joke, right? Ha ha, very funny. Don't think of it as driving a gas-guzzling car. Think of it as setting fire to the source of the imperialist Bush family's wealth! I really have to go to the bathroom...but THE BEARD SAYS NO. I have watched as the vast, ever growing numbers of comic book downloaders has grown from 700 to over 12,000 in the space of 2 years. Every Thursday and Friday, the comics that you buy at your local shop are torrented all across the globe where eager readers download them to read on demand. Is this legal? Is it right? Those are questions I can't answer. What I can say is here is a PROVEN delivery system, using FREELY available software that the users have said they prefer. Not Macromedia Flash. Not Adobe Acrobat. CDisplay and CBRs. Let's face it - cbr is to comics what mp3s are to music - the way of the future. Most piracy doesn't spring from the desire to get free content. It comes from a desire to get it in a specific way. Successes like Apple's music business have shown that consumers will pay for content if it's offered at a fair price without unreasonable restrictions. Right now, comics publishers could enjoy a win-win situation - they could reach out to new fans and increase revenue - if they would just decide to take advantage of it. And if they don't? Worst. Decision. Ever. The comics industry needs an iTunes Level distribution model to survive into the future. Sadly, no such application exist currently, so we have decided to put our fate in the hands of those who would control this future - you. One big issue preventing the major publishers from embracing downloadable comics: take away their control of the distribution channel via Diamond...take away the costs of large-scale print runs and shipping...and suddenly the playing field looks a lot more level. An indie comic becomes as easy to find as the latest House of Infinite M Crisis tie-in. This didn't happen with the iTunes Music Store partly because there's more to promotion and exposure of music than the online equivalent of rack space; television and radio are a big factor in the music world. And too, Steve Jobs cut a favorable deal with the majors to get their back catalogs into the iTMS...part of the deal being that iTunes isn't open to just any musician who wants to upload his or her own music and sell it. Apple has the mechanism and software for doing just that already in place...but hasn't made it available to the public to stay on the good side of the major labels. With comics, television and radio exposure isn't an issue, so new content being displayed on a hypothetical "iTunes Comic Shop" would be just as good as showing up on the shelves of your local retailer. And that doesn't suit the business model of the major comics labels any more than it did the record labels. All that said, I can imagine DC, Marvel, Image, and Dark Horse teaming up to form an online "Diamond Comic Shop" closed to any other publisher, using a proprietary format only readable by their software, and charging the exact same cover price for issues. This would just hurt the retailers while leaving the Diamond monopoly intact to gouge the public. Paying 99 cents for a single music track is steep, but it's less than the record labels would like; we could easily find Marvel and DC charging $2.99 for a comic book download and swimming in the profits like Scrooge McDuck in his money bin while locking out everyone else. What we might want to do is find a simple format for downloadable comics -- an equivalent to mp3 -- and a simple but robust cross-platform reader available as a free download. The majors won't embrace it without some kind of DRM built in...but the DRM should be optional, for the indies who want to make their stuff free or don't mind people sharing. Because the mp3 format was already out there and growing in popularity, the record labels were pushed in the direction of supporting iTunes against their greedier impulses, while the mp3 format has stayed available for individuals to use. That same compromise might work for comics as well. What I didn't fully grasp at the time was that the open format was already in wide use: the .cbr file format used by comic bit torrenters. Armed with free bit torrent client software and free comics-reading software that can handle the .cbr format, a comics fan can go to certain naughty websites and download every comic that hit the stands this week, or a complete run of Grant Morrison and Frank Quitely's never-collected and never-to-be-reprinted masterpiece Flex Mentallo. When it's something that a company is selling even as we speak, it's no different from bootlegging copies of new CDs. But when it's something that the majors can't or won't release...the people uploading those scans are acting as samizdat archivists of comics history, filling a gap in the ecosystem left by the limitations of traditional print publishing. And when creators are publishing their own original material by uploading it in .cbr format...they're showing us what the future might look like. Ultimately, I think we'll still need that "iTunes Comic Store" with digital rights management and onerous copy protection to get Marvel and DC and Image and Dark Horse on board. But just as the popularity of .mp3s acted as a spur to Apple and the music industry, folks like the guys behind Flashback Universe may be the ones who develop the momentum to make it happen. There's only one actual comic available for download at Flashback Universe: Saturn Knight, a superhero story that acts as a breathless introduction to what appears to be a meticulously worked-out superhero continuity inspired by the Marvel Universe of the mid-Seventies. The art is just right, and the story presents an interesting conceit to justify the introductions. The cleverest part isn't in the story itself, but on the website: a set of character descriptions delivered by each of the main characters about one another. That one touch persuades me these folks might really have something worth coming back for. I don't think building a whole continuity all at once and introducing titles according to a preset plan is necessarily the wisest move -- every prior attempt to emulate Marvel and DC's present status by reverse-engineering it has failed. Besides, the majority of people who like superhero comics want more of the characters they already know, not new ones -- even if the new ones are similar, or better -- at best, the audience only seems willing to accept new characters who are blatant homages and/or allusions to the old and familiar, as we see in Astro City or Supreme or Big Bang Comics. So I'm not sure if this attempt will pan out...but I'm taken with the energy and enthusiasm and sincerity of the attempt, and I'll be waiting to see more. PodBrix is selling a toy recreation of the Apple "1984" Super Bowl ad which introduced the Mac. According to the maker, "this brick-based work is inspired by the classic TV commercial and features over eighty parts. 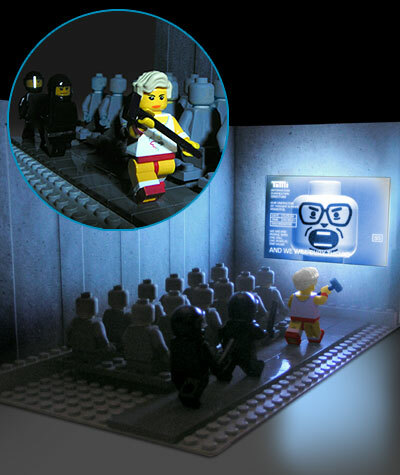 A static LED backlit movie screen complete with a minifig style 'Big Brother' completes the effect." Illuminating the LED requires three AA batteries, which are not included in the $198.99 price for the set. There are only 100 of the sets being made, so they'll probably disappear quickly even at that price. The ad was originally seen in non-toy form. The Wikipedia entry for this commercial includes a spoiler warning. That slays me too.